At this moment the Canadian dollar has fallen back even with the United States dollar. One US greenback may no longer be worth $1.10 Cdn, as it was when a friend of mine was up from New York a couple of weeks ago but it's at PAR. $1=$1. So how's this for yet another big cross-border rip off. I really like my new Sony A700 camera. Not so sure about Sony. And the one additional feature that most A700 users want is the vertical grip, that is just that a vertical grip --but it also has space for two batteries. 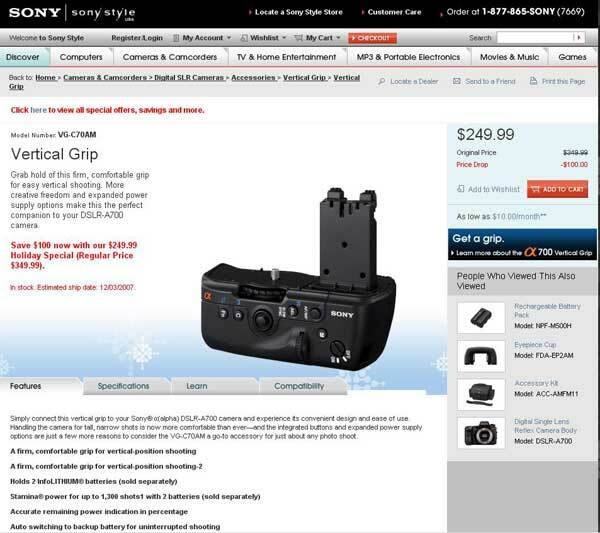 The manufacturers list price has been $399.99 in Canada and $349.99 in the US. 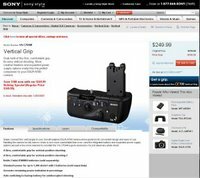 Sony US is selling the vertical grip through Sonystyle.com at $249 and giving US customers free shipping up until December 31.
but in Canada it is still $399.99 and no free shipping through the Great White North. And just for the record at the moment $1 Cdn = 111.04 Yen, $1 US =111.11 Yen. Not much of a difference is there?? ?